Warburtons, the British bread company, takes us back to the bakery to remind us that “We care because our name’s on it”, in Celebration, a television commercial directed by Vince Squib. 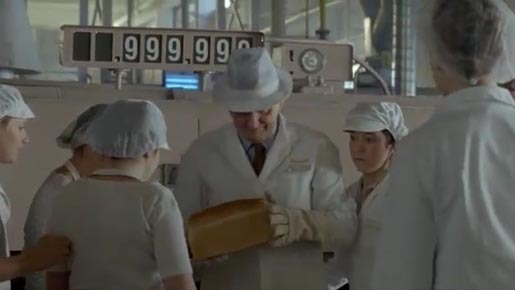 Bakery staff passionately celebrate the millionth loaf to come out of the oven, and more! The Celebration ad was developed at RKCR Y&R by creative director Mark Roalfe, copywriter Mark Waldron, art director David Godfree, planners Ben Kay, Liz Wolstenholme, Neasa Cunniffe, business director Nick Fokes, account manager Josh Harris and agency producer Jody Allison. Filming was shot by director Vince Squibb via Gorgeous. Editor was Paul Watts at The Quarry. Post production was done at The Mill by producer Liz Brown, Flame artist Barnsley and colorist Seamus O’Kane. Audio post production was done at Grand Central Studios.